Billy may have a new favorite cookie. He always favored the cooky press almond Christmas tree cookies but he really liked this new cookie. This cookie has cream cheese as one of the ingredients. It is a lot softer than the Christmas tree cookie. It also has a vanilla glaze on top and then sprinkled with sugar and decorated in the middle with a little pearl ball. Besides it being really good I thought they looked nice on my cookie trays. Back at the beginning of the month I had blogged about Cally and I packing shoe boxes with gifts for children for Samaritan's Purse. This organization was founded by Billy Graham's son Franklin. 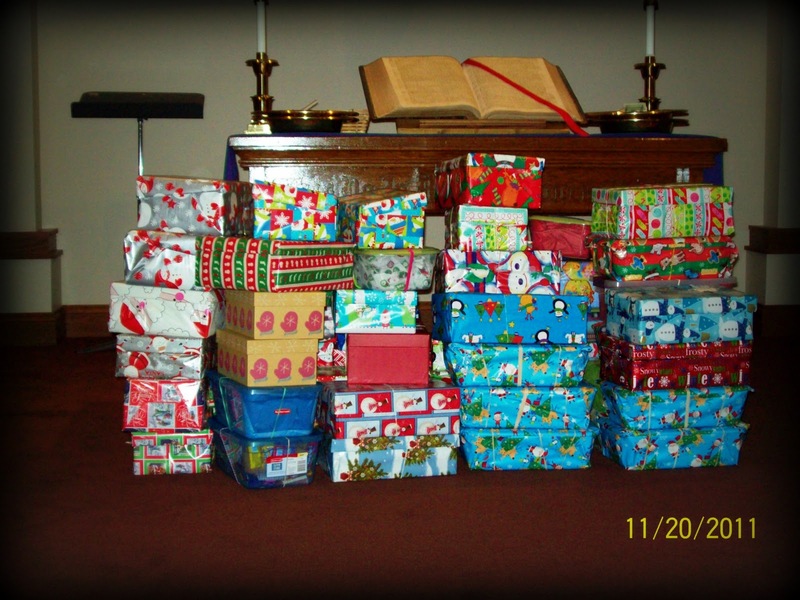 Each year Cally and I along with our church fill shoe boxes for children around the world. Cally and I paid for our shipping on line, that way we received a special bar code that went on our boxes so we could track where they ended up being delivered. We received an email a few days ago and our boxes were delivered to 2 little girls in the Ukraine. How fun it is to know we put a smile on the faces of 2 little girls all the way around the world. 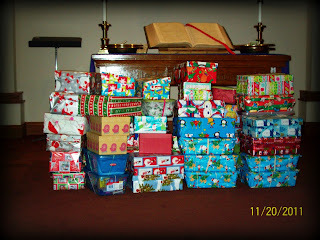 This is a picture of the shoe boxes that our Church family filled and sent, we gathered 71 boxes! 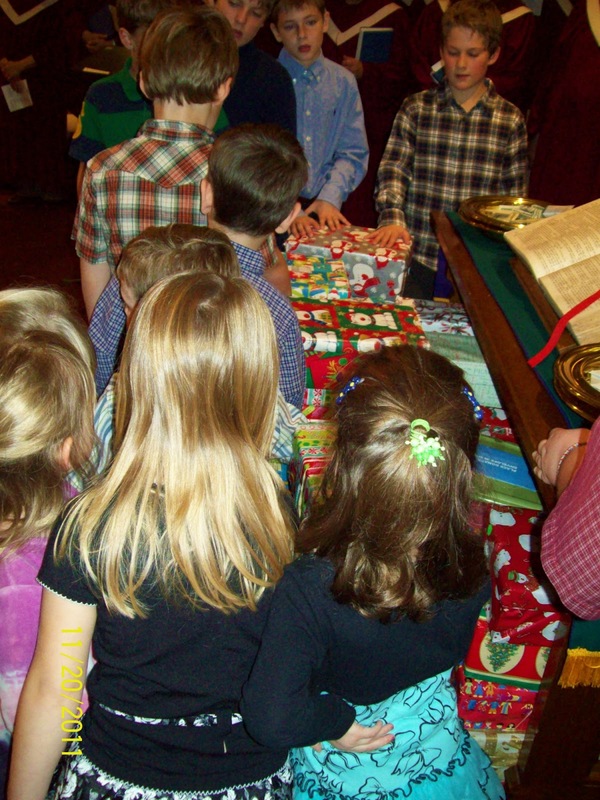 Here the children in our Church are laying hands on the packages to pray over them and for the children that will receive them. This is such a great ministry! Preheat oven to 350 degrees. In a large mixing bowl beat butter and cream cheese on medium for 30 seconds. Add sugar and salt. Beat until combined, scraping sides of bowl occasionally. Beat in the egg yolk, vanilla and almond extract until combined. Beat in as much of the flour as you can with the mixer. Using a wooden spoon, stir in any remaining flour. Pack unchilled dough into a cooky press fitted with desired shape plate. Force dough through the cooky press 2 inches apart onto an ungreased cookie sheet. Bake for 8 to 10 minutes or until edges are firm but not brown. Transfer cookies to a wire rack and let cool. If desired, brush or drizzle cookies with powdered sugar glaze and decorate with candies or colored sugar. Powder sugar glaze: In a small bowl stir together 1 C powdered sugar, 1 T milk and 1 t vanilla. stir in additional milk 1 t at a time, until glaze reaches desired consistency. If desired, tint glaze with food coloring.